Even though more and more cities around the nation are offering compost pickup along with their trash and recycling, most of us are on our own to figure out how to recycle our food waste. And the rate of composting bears that out: only 5% of our food waste makes it to compost instead of landfills or incinerators. But there’s a growing awareness of the food waste problem, and most people want to help. A recent study sponsored by the National Waste & Recycling Association found that 67% of Americans would be willing to compost food waste if it was more convenient to do so. 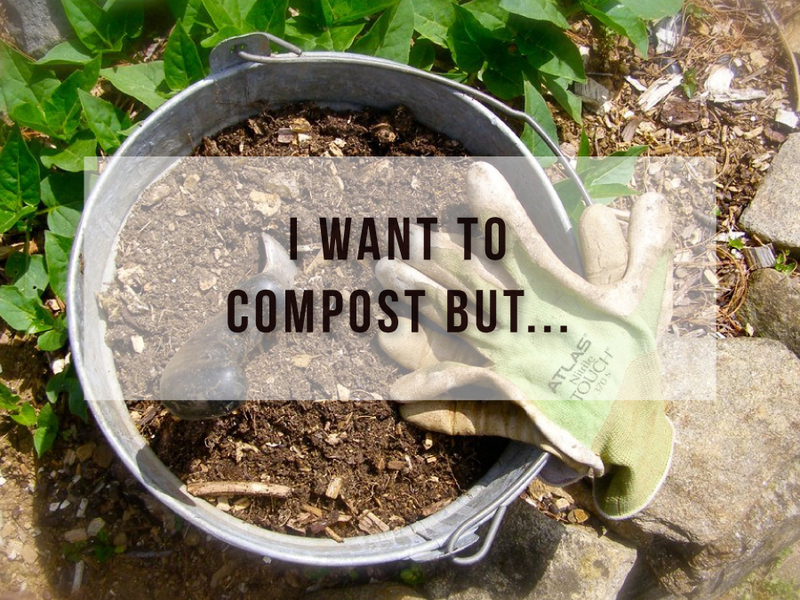 Since convenience means different things to different people, we thought we’d address a few common questions and issues that serve as barriers to composting at home. There are many different ways to compost — finding the simplest and most agreeable option for your household is the key to success. Hopefully some of these answers will help you find a solution that works for you. Composting organic material is fairly simple. Combine carbon-rich matter or browns, like dead leaves, with nitrogen-rich organics or greens like grass clippings and in the right ratio (about 1:2) and nature will start to break down your organic waste. The result will be wonderful organic fertilizer you can use on your plants and lawn. If you have your own yard, keeping a simple compost pile is easy. Composting effectively in other settings might take a little ingenuity. Composting can happen at any scale. Create a small bin in proportion to your small space. Limited outdoor space can mean less brown yard trimmings. If so, you can supplement shredded paper or mail. If your small bin can’t handle all of your food waste, it’s OK. Every small step to divert food waste is helpful. You don’t actually even need a bin to start composting. Many people want their compost contained to keep animals out, but simply combining materials in an out-of-the-way place will set nature on her course. You can purchase compost bins or up-cycle used bins. Many cities have composting bins that they will sell to you at a reasonable price, offering different sizes for different needs. Or you can make your own out of everyday materials — hardware cloth, chicken wire on a wood frame, or even snow fencing. I created my compost bin out of wooden shipping pallets I got for free. I also have a circle of hardware cloth, which a local gardening organization gave to me, that I can put up and take down as needed to create a portable compost enclosure. Most animals won’t get into your compost if your blend is right and you have enough of it, allowing you to bury fresh scraps. You aren’t going to compost meat, dairy, oils or high-carb foods like bread that attract vermin. But if critters are an issue, build a simple structure out of chicken wire, lining the bottom of the bin with gravel and then wire. Easier still, use a secondhand trash can or storage bin with a sealable lid, punch holes in the sides and voila! Oxygen, necessary for aerobic composting, gets in, but critters can’t. If you have the right blend of materials—piling on your browns (leaves, straw, shredded paper, or other woody materials)—it shouldn’t smell. A smaller compost bin, tucked out of the way in a shady, well-drained place won’t create noticeable odors. You can get away without turning your compost pile, but as an aerobic process, turning helps get oxygen to the microbes, fungi and other agents that do the work, and therefore speeds up the process, for the same reason that transferring compost between bins accelerates your way to some good fresh dirt. If turning your compost with a pitchfork sounds time-consuming, perhaps a compost tumbler would be right for you. Compost tumblers contain and elevate your food scraps and yard waste, and rotate, speeding up the composting process while keeping all organic products tidy, which makes them ideal for urban and suburban locales. A turn of the crank mixes compost without getting your hands dirty, and they are easier to empty than compost bins. Tumblers tend to cost a little more. Bins, on the other hand, hold more and are more durable because they lack moving parts. There are more advanced systems out there that will compost in four seasons and don’t require turning, like the Aerobin. But if you don’t want to go outdoors and you want your composter to be as convenient as your dishwasher, you might look into an electric composter. Keep in mind that these use energy, so they’re not as environmentally friendly as non-electric options. There are so many fantastic uses for compost. It can be used in a garden, spread on your lawn, used as top-dress around trees, or used to mulch any nearby plant beds. Any gardener will happily take your rich, loamy compost. Large amounts of organic material break down into a much smaller volume of compost. And it only gets better with age, so there’s no pressure to use it right away. Try vermicomposting. Keep redworms (a type of earthworm) in a container with sufficient air circulation, feed them kitchen scraps, and they produce a dark humus that you could use to top-dress your houseplants. This can be kept conveniently and invisibly beneath your kitchen sink. Worms do their composting work out of sight and out of mind. But there is a method of composting that doesn’t involve worms called bokashi, which is an anaerobic fermentation process beginning with a starter of wheat bran inoculated with microbes, usually from a bokashi kit. This method is good for people who don’t have outdoor space and don’t want worm pets. 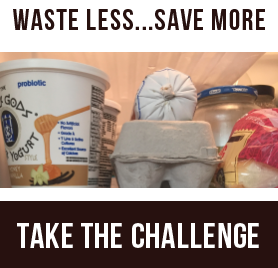 Some advantages include bokashi’s convenience and ability to process food waste that you can’t compost aerobically, including dairy and meat. Congratulations! You can set up a three bin system, a permanent structure made of wood or concrete blocks that has three separate sections, so that you can move your compost from a new, to aging, to finished section, which will accelerate the composting process. Every day Americans throw away tons of organic material that can be composted. The EPA reports that organic, easily compostable materials such as paper products, yard waste, and food waste continue to be the largest component of municipal solid waste, comprising over 50% of total discarded trash. Sustainable America is committed to cutting food waste in half by 2035, as well as counteracting factors like soil degradation that undermine American food security. Composting is a valuable tool to reduce the loss of nutrients that are important to environmental health and food production.